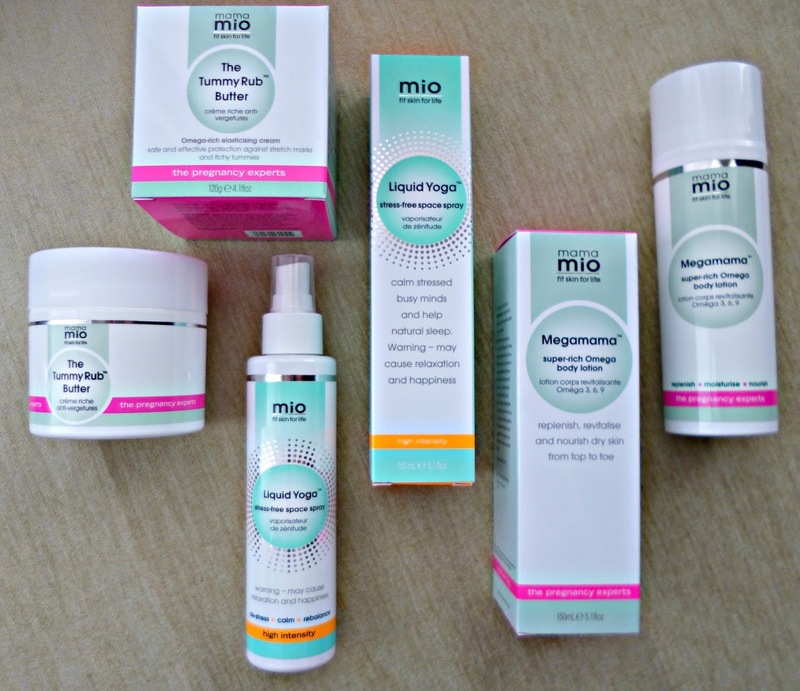 When it comes to pregnancy skincare, there aren’t too many ranges that are available that balance more natural ingredients and availability, but Mio skincare do just that in some very beautiful formulas. From the minute I found out I was pregnant I have been diligent about taking care of my growing bump daily. With my first child I got stretch marks in the very final week of pregnancy and although I know that there are a few factors such as genetics etc… that make them hard to avoid completely I also have found that their appearance can be dramatically improved. Mio is a brand that I had being seeing across blogs and in shops for some time but had never tried before, the range was started by four women who after having their children felt there wasn’t a range out there to cater for them and the needs that pregnancy brings and so the Mama Mio range was born. Eight years on and they have also developed a second range Mio, catering for women who lead active lifestyles. Mio literally means Me, so is all about making taking care of yourself a ritual. I have been testing a few products from the pregnancy range on my ever growing belly and have been really impressed with the formulas, I am still free of new stretch marks at almost 38 weeks and although I can’t give these products the entire credit given I have only had them the last few weeks I can say they have been an absolute joy to build in to my routine. The Megamama Super Rich Omega Body Lotion (£24.50 for 150 mls) Is a lovely nourishing but easily absorbed body lotion. The lotion is safe to use whilst pregnant and breastfeeding and I love that it has a very light and fresh scent that isn’t at all overpowering, perfect for this delicate time. Mamo Mio products have lot’s of great natural ingredients, but it is worth noting that they aren’t 100% natural and contain some synthetic and naturally derived ingredients. Both of the products I have tested have some light silicones in to help with absorption, I despise silicone heavy formulas but in this case it makes sense to give enough moisture for stretching skin without having to wait hours before dressing and I think these will appeal to many who are just starting out with more natural formulas too. There is no mineral oil at all, so the lotion is based around Omega rich plant oils such as pumpkin and chia oils as well as Shea butter, coconut oil and squalane which are all excellent moisturisers. The scent comes from a custom blend of 10 pregnancy safe essential oils, which is really beautiful, I know a lot of women become more scent sensitive in pregnancy myself included but these products are really gentle. Considering it’s lighter nature this body lotion does an amazing job of calming an itchy belly and would be perfect to use from whenever you find out you are pregnant or even before to prepare the skin. The Tummy Rub Butter (£23.50 for 120 mls) Is a richer body butter perfect for night time use. It has Organic Argan, Rosehip, Shea Butter, Sweet Almond, Avocado and Sacha Inchi oils which together really pack a moisturising punch. Both of these products are such a pleasure to apply daily and you really do need to be persistent for these things to work. I also really like that Mio recommend you continue to apply the Tummy Rub butter for about four months after the birth, I think it is too easy to forget that the period where your skin is shrinking it will need as much care as when it was stretching. I shall be continuing to use both of these post pregnancy alongside other body oils and products and am hoping that my body will bounce back sooner as a result. The last product I have been trying is a gorgeous aromatherapy spray the Mio Skincare Liquid Yoga Stress Free Space spray (£19.50 for 150 mls). Although my pregnancy has been a good one the last few weeks have been stressful trying to balance all the things I need to do with some health issues and this spray has been well loved and used. It has a lovely blend that is fresh and cleansing as well as relaxing with Lemon, Chamomile, lavandin, and mint as well as other lovely essential oils. It comes everywhere with me, including my car and desk and is brilliant to spray at any time of day. You get a really large bottle for your money so I am hoping this will last me a while! I have to mention, because it doesn’t happen with every brand that you can find full ingredients lists on the Mio website. I would highly recommend you take a look if you are pregnant I have thoroughly enjoyed exploring the range.